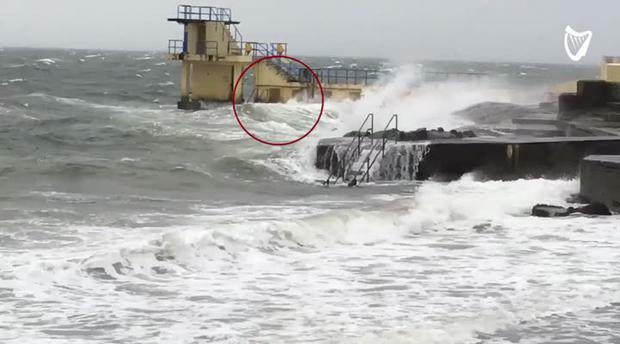 Footage has emerged of a man swimming in Salthill, Co Galway while Hurricane Ophelia rages throughout the country. The man was seen swimming along the promenade as waves crashed against the shore. Despite numerous warnings telling people to stay inside and avoid going near the sea, there have been numerous reports of people not paying any heed to this safety advice. Two kite surfers had to be rescued in Louth earlier today, and a woman told RTÉ Radio One's Liveline that people have been swimming in the Forty Foot in south Dublin. Transport Minister Shane Ross said earlier "The underlying message is people should not be driving at all now. Everyone should be staying indoors. "The whole emphasis for today is on safety, keeping people alive and to ensure we don't have a repeat of damage."